Synopsis: Manuela feels the pressing need to go in search of the father of her son who has just died in an accident. The son’s overriding obsession during his life was to find the identity of his father, which his mother had always concealed from him. Manuela travels to Barcelona to look for the boy’s father. She eventually finds him, although he is now a transvestite known as Lola. The search for a man with this name proves to be no easy task. 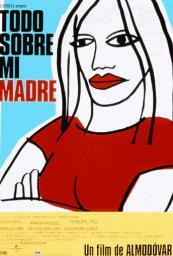 • All About My Mother was Pedro Almodóvar’s 13th film and the first one to be shot in Barcelona. Filming took three months, and 95 of the 122 scenes are set in Barcelona. • It is certainly the most successful film to have been shot in Barcelona. Over 2.5 million people saw it in Spain during the 60 weeks it was in cinemas. In 1999 alone it made 68 million dollars worldwide, making it Europe’s fifth highest-grossing film and the world’s 50th highest-grossing film. • It won 50 awards from film festivals and academies. In addition to the Oscar for best foreign-language film, it won the best-film awards from almost all the European academies. • The title All About My Mother was inspired by J.L. Mankiewicz’s All About Eve. Women and actresses are one of the themes of Mankiewicz’s film. Women who confess and lie to each other in a theatre dressing room which has become the mausoleum of the female universe. • In Almodóvar’s words, the film is devoted to actresses and, in particular, to those women who have been actresses at some time in their lives. He has always been interested in films that reflect the world of cinema, the world that tells stories about actors, directors and writers. • In the dedication that closes the film, Almodóvar names three actresses whose performances have moved him the most: Gena Rowland in Opening Night, Bette Davis in All About Eve and Romy Schneider in That Important Thing: Love. According to the director, the spirit of the three actresses imbues the characters in All About My Mother with smoke, alcohol, despair, madness, desire, frustration, loneliness, vitality and understanding. • Almodóvar considers that there is no better spectacle than to see an actress cry. In this film, Cecilia Roth has plenty of opportunities to cry transparent, torrential tears. • The film-maker defined his film as a crazy, baroque drama with extreme characters, battered by fate, without being too grotesque. As a counterpoint to his excessive personality, during rehearsal he decided that the acting should be extremely muted. This was the key and the challenge which the actresses took on board straightaway. • Pedro Almodóvar went on the same journey through the streets and neighbourhoods of Barcelona as Manuela and the other characters in the film. The director said that he found the same relaxing feeling as Manuela: “The entire crew have soaked up really good vibes”. With the help of his artistic director, Antxon Gómez, who lives in Barcelona, Almodóvar chose settings that are very familiar to the people who live in and know Barcelona. Manuela rides past at night in a taxi. Manuela rides past in a taxi and stops in front of the Nativity façade. Agrado’s flat is right opposite the Palau. Manuela and Agrado walk past, arm in arm. This is the house where Sister Rosa’s parents live. Manuela and Rosa sit on a bench chatting. Manuela goes to see the play A Streetcar Named Desire. Manuela and Huma meet Nina. Manuela and Rosa go to see the doctor. Manuela and Rosa meet the father and his dog while they are out walking. Rosa’s burial and the meeting between Manuela and Lola. World premiere of the film on 8th April 1999.